Reference number for this case: 9-Aug-54-Marseille. Thank you for including this reference number in any correspondence with me regarding this case. [Caption of photograph:] Will the photograph communicated by Mr. Alyon overcome the skepticism of Marseille about the saucers? A resident of Marseille has "photographed" saucers! 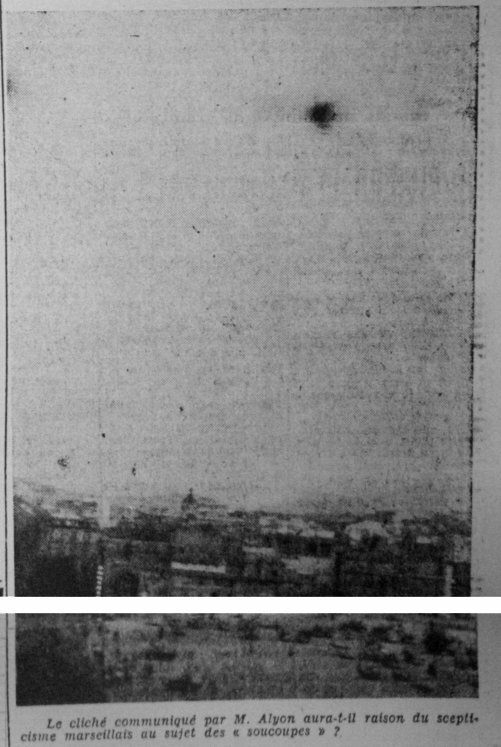 To the "flying saucers" and "flying Cigars" file, Marseille can add only one testimony, that of Mr. L. Alyon, 2, Colbert street, to whom we owe the photographic document illustrating this article. Observation a flying saucer and a cigar flying above Marseille. Date of the observation: Monday, August 9, 1954. Direction: appearance: East; disappearance: West. Color: in the beginning, dark, haloed, scintillating with the acceleration. Approximate dimension: six times the cupola observed at the back of the photograph. Approximate altitude: three times the height of the hills. Approximate speed: normal at the beginning, supra-sonic at the departure. Duration of the phenomenon: two minutes. General description and observations: dark spherical craft, luminous in its periphery, joining a second cylindrical object being behind the fog, emitting a sort of luminous flickering, the saucer then made an sudden 45° turn towards the West and merged with the second object which disappeared at a supersonic speed in the cited direction." Let's not offer any comment, we are not qualified! Let us notice however that in the matter of "flying saucers", Mr. Alyon, though resident of Marseille, was much less favored than these two Norwegian girls (see "La Provence" for yesterday Thursday) who conversed with a pilot of an interplanetary apparatus. Ah! These people of the North! In Marseille, what d'you want? We're satisfied to formulate wishes when shooting stars rain. Eventually we would risk an observation but we are not "saucer-hiking" (yet). There are thus all chances that the man simply repeatedly produced hoaxes. [lp1:] Article in the regional newspaper Le Provençal, Marseille, France, page 5, August 27, 1954. 0.1 Patrick Gross April 20, 2006 First published.